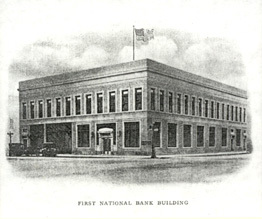 John M. Wallace, of Chicago, coming to Greeley, saw the need for a national bank. The need became a reality and the charter was applied for on February 27, 1884, with the endorsement of the Honorable James B. Belford, Colorado's representative in Congress. The charter was granted May 6, 1884, for a period of 20 years, and was renewed March 15, 1904, and again in 1924 for a further period of twenty years. 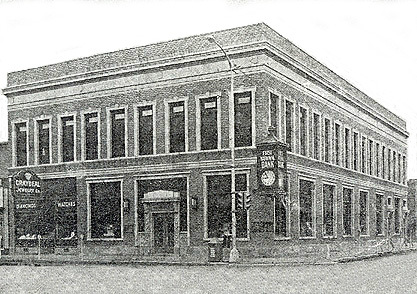 The bank opened its doors for business on June 10, 1884 with a paid in capital of $80,000 in the handsome brick building shown. Initial home of the First National Bank 1884 (Town & Country News 9/26/1974) from the Archives City of Greeley Museums. 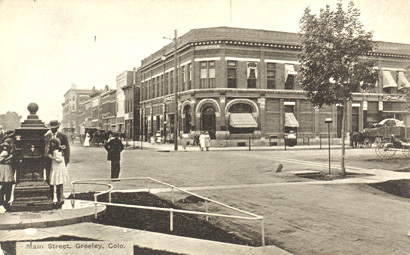 This was the first bank organized in Weld County under the "National Bank Act" and thereby became in name as well as in fact "The First National Bank of Greeley Colorado", and the First National Bank in Weld County. At that time Weld County embraced all the land now known as Weld, Morgan, Logan, Sedgwick, Phillips, and parts of Yuma and Washington counties. Thirty five years later there were sixth-nine banks in that territory. The seal adopted by the bank at its organization shows a farmer irrigating his fields. Weld County's development which was based on irrigation, justifies the seal. The Board of Directors in 1884 included H. M. DeVotie, J. L. Ewing, D. B. Wyatt, E. R. Thayer. John M. Wallace was president and Brainard Harper was cashier. 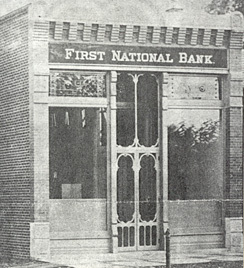 The First National Bank building was remodeled and enlarged in 1885 and is shown in the era of the gas light at its location of Main and Monroe which had been renamed to 8th Street and 9th Avenue. First National Bank check June 2, 1899, signed by James Canlin with revenue stamp. 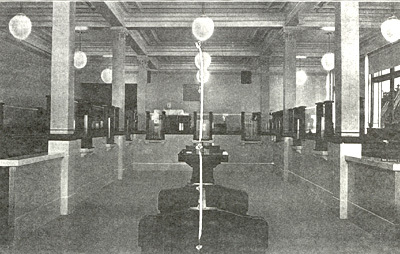 it was printed between March 14, 1924 and August 22, 1925. National Bank notes from the First National Bank of Greeley are listed as scarce (15 large size and 26 small notes are known). The bank issued $5, $10 and $20 notes of second charter, brown backs; third charter $ 10 and $20 red seal notes and $5, $10 and $20 date back and plain back large size notes. They also issued $5, $10 and $20 type one and type two notes of 1929. In 1935 there was $6,100 in large size notes and $93,900 total outstanding notes.